There are several laundry enhancers available on the market today. I catch myself strolling down the aisle inhaling the aroma of the various products. 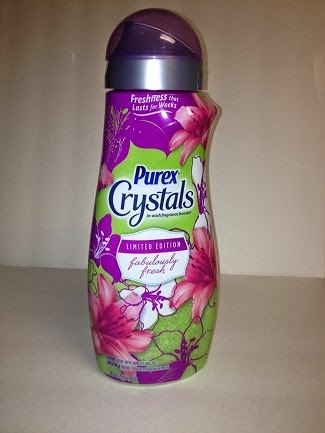 One of my favorite products is the Purex Crystals line. With a variety of scents, you should be able to locate a favorite. These crystals also pair well with the Purex detergent, and Purex dryer sheets. Purex dryer sheets can be difficult to find in some locations. I found them in another town at Walmart. Recently, my local Walmart added them as well. Purex detergent can be found nearly anywhere. Crystals are sold in several locations, but scents available do vary. 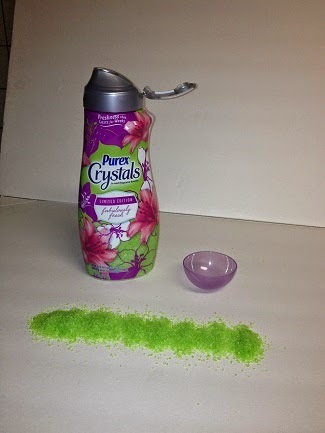 Purex has introduced a new scent to the Crystals line. New Purex® Crystals Limited Edition Fabulously Fresh, is the latest Purex® Brand laundry enhancer bringing a fresh sensation to your laundry experience. Unfortunately, the key word on the bottle is "Limited Addition". I'm unaware of whether or not they will continue producing this scent. The floral aspect of the Crystals doesn't seem to be overwhelming. I want to say there is a hint of fruit within the scent, but I'm not positive. It has a very pleasant aroma though. An aroma that my entire family loved. 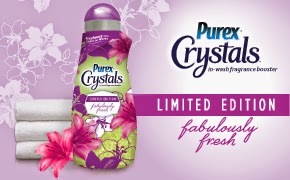 I do hope they continue producing the New Purex Crystals Limited Edition Fabulously Fresh crystals. The cap is easy to remove from the bottle. It can be slightly difficult to replace the cap when you are in a hurry. Sometimes it tends to slide back off of the bottle. This is only a minor issue as I always keep the cap on the side. The top pops open easily, and tightly snaps closed when finished. However, it may open if dropped on the floor or hard surface. Cleaning the crystals from the surface and floor can be challenging! The crystals are tiny; you are bound to miss some while cleaning. This can be dangerous to pets and children if consumed. Please be careful when pouring the crystals into the cap and/or laundry. I made a mistake of spilling some while trying to pour the crystals back into the bottle. It took a good while to clean them up. I'm not even sure that I gathered all of them. Measuring the amount of Purex crystals is a breeze. Simply pour your crystals to the fill line of your choice: Small, medium, or large loads. For added freshness, use more. I always fill mine to the top on large loads. For smaller loads, I use 1/2 a cap. This product is a natural softener and is safe for your clothes. After reading the back of the bottle, this product can be used in both topload and front loading machines. It states not to pour the crystals into the dispenser. Always pour directly onto clothing at the beginning. The crystals are a salt-like appearance. You can find the ingredients on the Purex website. You can see how each crystal is infused with fragrance in the picture below. The amount of crystals below is nearly about 3/4 cap. The end result was wonderful! 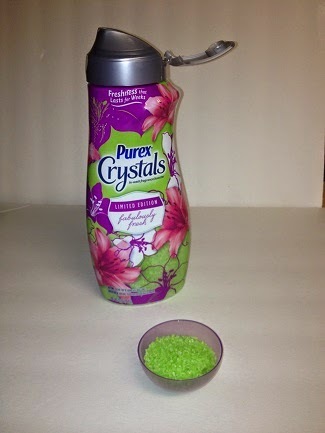 I used these crystals, Purex Mountain Breeze laundry detergent (liquid), and Purex lavender dryer sheets. I know the combination of scents may sound odd, but they turned out nice. My first trial was on a couple of our blankets. I can still smell the fresh scents after a week of use. Honestly, the scent is beginning to fade now. I will need to wash them again soon. In the end, I'm content with this product. Will definitely purchase them in the future if I can locate them. DISCLAIMER: I received a free sample of Purex Limited Edition Fabulously Fresh crystals, in exchange for my product review. However, all opinions are mine and unbiased. It is important for me to share my honest feedback on a product.